Summary. 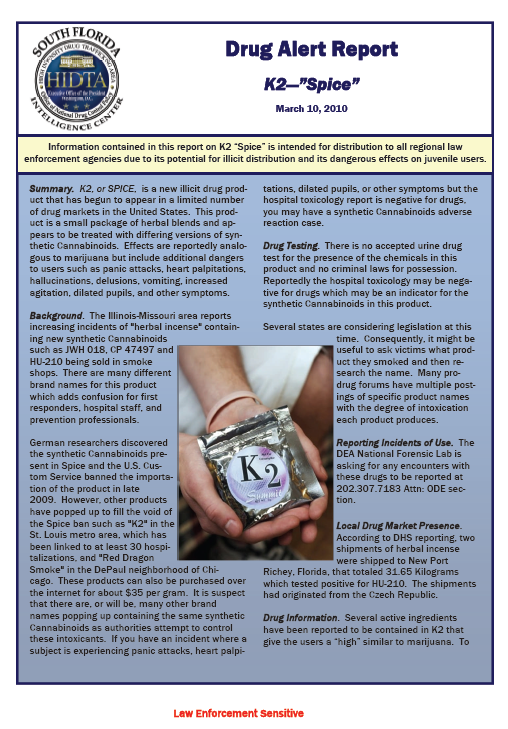 K2, or SPICE, is a new illicit drug product that has begun to appear in a limited number of drug markets in the United States. This product is a small package of herbal blends and appears to be treated with differing versions of synthetic Cannabinoids. Effects are reportedly analogous to marijuana but include additional dangers to users such as panic attacks, heart palpitations, hallucinations, delusions, vomiting, increased agitation, dilated pupils, and other symptoms. Background. The Illinois-Missouri area reports increasing incidents of “herbal incense” containing new synthetic Cannabinoids such as JWH 018, CP 47497 and HU-210 being sold in smoke shops. There are many different brand names for this product which adds confusion for first responders, hospital staff, and prevention professionals. Smoke” in the DePaul neighborhood of Chicago. These products can also be purchased over the internet for about $35 per gram. It is suspect that there are, or will be, many other brand names popping up containing the same synthetic Cannabinoids as authorities attempt to control these intoxicants. If you have an incident where a subject is experiencing panic attacks, heart palpitations, dilated pupils, or other symptoms but the hospital toxicology report is negative for drugs, you may have a synthetic Cannabinoids adverse reaction case. Drug Testing. There is no accepted urine drug test for the presence of the chemicals in this product and no criminal laws for possession. Reportedly the hospital toxicology may be negative for drugs which may be an indicator for the synthetic Cannabinoids in this product. Several states are considering legislation at this time. Consequently, it might be useful to ask victims what product they smoked and then research the name. Many prodrug forums have multiple postings of specific product names with the degree of intoxication each product produces. Reporting Incidents of Use. The DEA National Forensic Lab is asking for any encounters with these drugs to be reported at 202.307.7183 Attn: ODE section. Local Drug Market Presence. According to DHS reporting, two shipments of herbal incense were shipped to New Port Richey, Florida, that totaled 31.65 Kilograms which tested positive for HU-210. The shipments had originated from the Czech Republic. Drug Information. 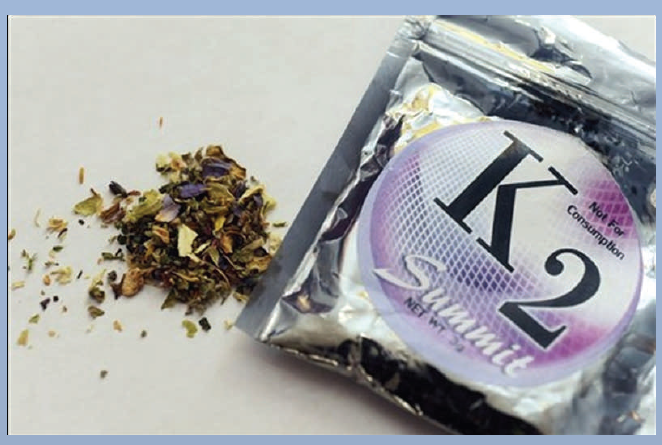 Several active ingredients have been reported to be contained in K2 that give the users a “high” similar to marijuana.